My new desk is starting to take shape. I'm hoping to get this part finished by Sunday. Then I get to figure out how to mount the LCDs. 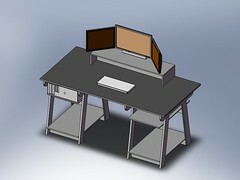 My second draft for the new desk. 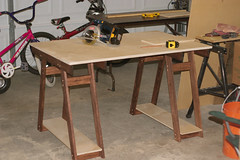 I haven't decided on the wood yet, but probably Birch plywood for the surfaces and Birch or Oak 1x4s for the trestles. It will be finished with a dark near black stain. I'm kicking off the new year with this quick little Nerf Mod, or how to add a little too much power to a standard cheap NERF N-Strike Nite Finder. 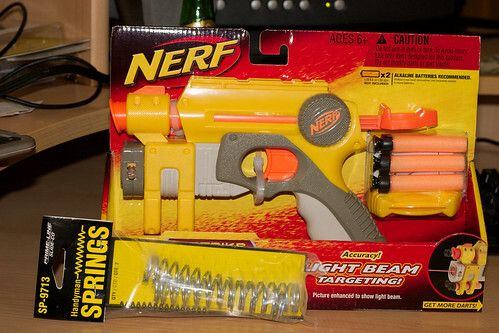 I purchased the gun at Target, but they can be found most anywhere toys are sold in a variety of colors. Amazon has a couple listed for 3rd party sale here and here at outragous prices. Look around, you can probably find them for under $10. Century Spring #C-836 7/8" by 4"
If you try other spring sizes please let me know. I actually think this would be better with a slightly weaker spring. More on that later. 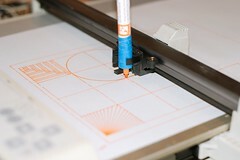 I picked up this old XY plotter off eBay with hopes of making it work as a Laser Etcher. So far I've got it working, it passes the self test and I managed to hack up a serial cable to send it an hpgl file. The next step is finding decent hpgl tools for Linux and see if I can get accurate results.